Dylan Field is the co-founder and chief executive of Figma, a cross-platform design and collaboration tool. Before starting Figma, Dylan interned at LinkedIn, Flipboard, and O’Reilly Media. 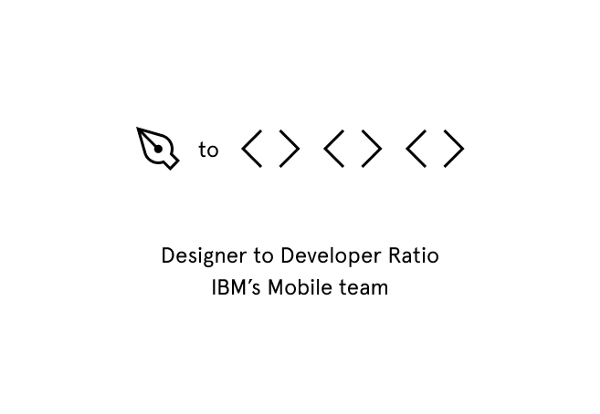 You know design is having its moment when IBM, the stodgy normcore dad of the tech industry, gets in on the action. 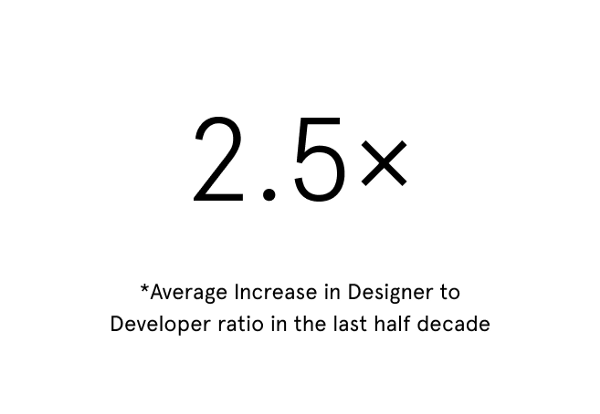 In the last five years, Big Blue has grown its designer to developer hiring target from 1:72 to 1:8. It’s not the only one — companies across Silicon Valley are recruiting far more designers than ever before. I’ve been hearing about this hiring crunch for years, ever since we started Figma. We wanted to put some hard numbers behind the trend, so we reached out to our network. 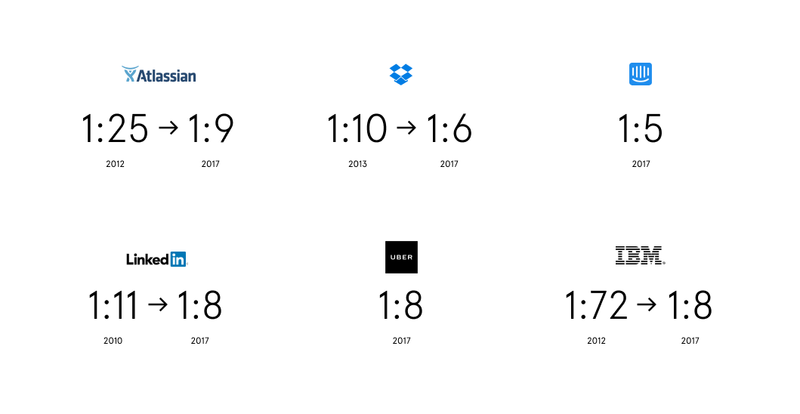 We gathered the stats on six companies’ designer:developer ratios in 2017, and how it compares to half a decade ago. The growth is staggering — enough so that the venture firm Kleiner Perkins decided to include the data in their Internet Trends report. These numbers show that ‘design thinking’ isn’t just a trendy new buzzword — companies are willing to put money and staff into it at a higher rate than ever before. It’s a small sample size, but it’s some of the first hard data available on tech design hiring. The companies willing to go on the record were mostly enterprise, so this sample doesn’t even include the consumer startups that famously focus on design, like Airbnb. Facebook staffers told us the social network has quadrupled its designer hiring target in the last two years alone — but Facebook wouldn’t officially comment. In the last few years, many big tech companies, including Facebook, bought out entire design firms to hit their targets. John Maeda mapped out all the acquisitions in his big Design in Tech report this year. So…why is this design arms race happening? We’ve hit that point in the tech industry where engineering is becoming more and more commoditized. With AWS and frameworks like React Native, practically anyone can spin up an app. That’s how you wind up with “Tinder for threesomes” and the messaging classic “Yo.” In this new era, what really sets companies apart is the user experience — a perspective designers know intimately. Since design-thinking is one of the few things that can’t be automated, it makes sense that companies are wooing designers like they’re Ohio voters in an election year. Unfortunately, there’s just not enough people to meet the surge in demand. Universities have fallen far behind Silicon Valley — hardly any art schools offer tech design majors. The Bureau of Labor Statistics doesn’t even include UX or UI design as a career in its surveys. Despite the lack of established training programs, product designers must master a mile-long list of skills. They need to know how to code, basic user research techniques, data visualization, the architecture of apps and websites, and — of course — all the basics of graphic design like typography and layout. Design leaders predict it will take years for education to catch up. The story isn’t much better in Silicon Valley. The focus is coding, in everything from hacker bootcamps to educational initiatives with millions in tech backing. Design is forgotten. To hire good designers, founders have to battle over them — making pacts like handing over their first born child or turning their souls into horcruxes. It’s only going to get worse as companies continue to ramp up their design hiring goals. Preparing the next generation of designers will have to be a collaborative effort among schools, the tech industry, and design tool companies themselves. At Figma, we’ve made our design product free for students, which we think is a crucial first step to lowering the barrier to entry. But it’s not enough. We’re trying to figure out how else to tackle this problem, and we’re curious to hear about other’s approaches. Reach out to us and let us know what you — or others you know — are doing to help grow the design pipeline.